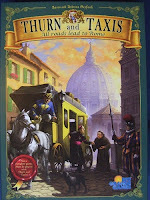 This is another great expansion for the game Thurn and Taxis and this review will complete my 3 part review of Thurn and Taxis and its expansions. If you haven't heard of Thurn and Taxis, check out my review on the base game first - and yes, you will definitely want an opportunity to play or own this game. This expansion offers a couple of different things you can play with the original base game. You can play them together or you can choose to play with one or the other. The first one is actually where the title for this expansion comes from, "All Roads Lead to Rome." This expansion includes a board that is placed off to the side and consists of different pathways that lead to Rome. Each player secretly at the beginning of the game chooses to place certain religious characters with different valued points attached to each face down in each carriage. The carriages (5 total) are moved when a player decides not to place a post office in a town of that same color. If you get to Rome too soon, another players character of the same type would keep you from scoring those points, but if you don't arrive at all, no luck either. It is an interesting idea and is pretty interesting, but not my favorite addition. The other expansion provided is basically some tokens which are taken when you choose a specific action. You are rewarded by diversifying your action choices and you get to turn these in for bonuses (get an additional card, victory points, or place a post office in a city of your choice). I really like this aspect of the game and it really can help you snag some of those bonus tiles a little bit easier. Overall, the expansion is a good one, but if you were to choose, I would say go with the Power and Glory expansion. Again, a big SHOUT OUT to Rio Grande Games for making this review possible, and for making such great games and that is How Lou Sees It!